In my experience in practice, there is a relationship between a person’s wealth and their concern for their own and other people’s rights as citizens. The poorer people are, the more important their rights are to them. In some cases it is all they have. And who do they turn to help them? In most cases they will turn to a lawyer in a small law firm on the corner or above the dry cleaner or near the station. Random selection it may be, but looking to the only profession that can offer real help. This presents a huge challenge for those lawyers who must walk the tricky path between financial sustainability and the natural feeling that so many lawyers have that they owe something back and should spend some of their training and skill for the betterment of society at large in the form of pro bono or legal aid. It is one of the oddities of our societies that the annual Pro Bono law awards always seem to be won by the well-funded pro bono firm of a large law firm, rather than to one of the thousands of lawyers in small law firms around the country doing ‘coal face’ pro bono work every day of the week. This huge contribution to society goes largely unheralded. Some are able to get legal aid funding for some of the work, but legal aid budgets are shrinking and it will become progressively harder to maintain financial viability relying on the legal aid – it will become essential to have a good flow of private work too. 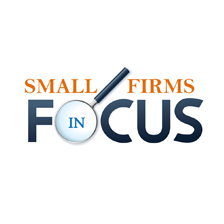 So what is the answer for small law firms? They need to be efficient, do fairly from all private work, and to have a sensible informed discretion about what they can afford to give back to society. Small firms are very different to large firms. Whilst a large firm can often be rewarded for inefficiency because it can record and bill time so easily, small firms must be efficient to survive and prosper. Great technology is actually the only way to achieve this. A lawyer recently commented to me that she did not think that technology provided much productivity advantage. The question I posed to her was how many typists she thought she would need if the firm did not have Microsoft Word. Of course she had never thought about it that way because she has never practiced law without Microsoft Word. But those of us who can remember the day, and have observed progress over the years, know that 20 years ago a busy partner in a small firm kept 3 typists busy, whereas today it would probably take 3 busy lawyers to keep one para-legal busy. This is solely attributable to technology. The need for small firms to be efficient grows daily. Many firms are stuck using old inefficient technology because in their word it ‘does the job’. Well actually it doesn’t. They are running inefficiently and have to work harder to survive and prosper. It is more difficult for them to give back to society. The truth often is that it is easier to continue doing what we have done, than to go through the disruption of pain. So if you are a firm that wants to have balance, you will find it much easier if you also have the technology that allows you to. Cloud practice management is now cheaper than ever before – you no longer have to spend money on servers, backups and security as all of these concerns will be the responsibility of your software provider. With great document production systems, access to the proven intellectual; property contained in pre-configured matter types suitable for small law firms, all integrated with the record keeping systems you need you can get up and running profitably. Because proper cloud software also provides mobility you will find that practising law can be less stressful because of the confidence you will have that you are increasing your income and lowering your costs. Click here for more information about cloud technology.